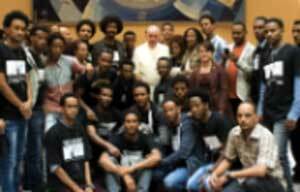 Last night, Pope Francis had a private meeting with a group representing survivors of the migrant boat which capsized off the coast of Lampedusa island one year ago. At least 370 people lost their lives in the tragic accident. Pope Francis has called on the men and women of Europe to ‘open the doors of their hearts’ and welcome migrants who risk their lives at sea to flee war and poverty. About 50 survivors mostly living in northern Europe, will travel to Lampedusa today. They are calling for an international memorial day for the thousands who perish at sea each year trying to reach Europe. During last night’s meeting, Pope Francis said he had difficulty in expressing himself to them. He told them “words are not enough to describe what you have suffered, this can only be contemplated in silence, with tears and by trying to find a way to be close to you”. Two refugees addressed the Pope on behalf of the delegation, thanking the Holy Father for his efforts on behalf of migrants and asking for his continued support. They highlighted the pressing issue of the identification of the lost at sea. Before greeting and sharing a few words with each of the survivors and family members of those lost at sea, the Pope spoke of how the lives of people who need to migrate are “hard” adding that when their journey of migration meets with tragedy, it becomes even harder. He also described the harsh reality for migrants who make it to port safely but find “closed doors” “do not know where to go”. At times like these, Pope Francis said, “its most important to find hearts with open doors”. Here the Holy Father appealed to the people of Europe to be close to migrants and asylum seekers, who have a right to remember their history, homeland and their dead. And he assured them of his and the Churches proximity and support, particularly in their effort to identify the remaining bodies from that tragedy. The delegation gifted Pope Francis an iron sculpture of a bottle adrift at sea, containing a family instead of a message. The delegation was organized by the “Committee on October 3,” chaired by Tareke Brhane, and was accompanied by Archbishop Konrad Krajewski, Papal Almoner, and Fr. Giovanni Lamanna, former President of the Astalli Center. A bill has been presented before the Italian parliament proposing October 3 as the ‘World Day in Memory of Victims at Sea’. Thank you for your visit, thank you very much for coming. I find it difficult to speak to you because I don’t know what to say. I cannot express what I feel, because words are not enough to describe what you have suffered, this can only be contemplated in silence, with tears and by trying to find a way to be close to you. I have listened closely to your requests, and, for my part, I will do everything possible of what you have asked. I asked Father Giovanni to help you, and I also asked Father Corrado to be close to you, in a sign of my closeness and that of the Church of Rome and so many men and women who feel this tragedy. The lives of people who need to migrate is hard, and when there are tragedies on this journey of migration, it becomes even harder, and when the end for those who have managed to reach a safe harbor seems certain then other even harsher realities arise, very often doors are closed, and you do not know where to go. There are many men and women here in Italy who have an open heart for you. It’s most important that the doors to hearts are open in times like these…. I ask all the men and women of Europe to open the doors of their hearts. Behind, there are memories, there is the homeland and there are the dead. The migrant cannot forget this, it is part of his life, there are his ancestors, his History, his Homeland and also his dead, and you have asked to at least be allowed collect their bodies… ..
Let me just say to you that I am close to you, I pray for you, I pray for closed hearts that they may open. And everything that I have available to me, is available to you. I would like you to feel this welcome, which is not only mine but of the many people who care for you. Do not doubt, we are with you. Thank you.